An Israeli soldier on a tank in a staging area near the Israel-Gaza border, Aug. 2, 2014. The Israeli army says it has determined that the 23-year-old soldier it earlier said was captured by Hamas on Friday was killed in action. An army spokesman says its chief rabbi determined Second Lieutenant Hadar Goldin is dead and personally delivered the news to his family. The army initially said Hamas fighters abducted Goldin when a suicide bomber attacked Israeli soldiers dismantling a tunnel near Rafah Friday. That attack left two other Israeli soldiers dead and ended a cease-fire after a little more than one hour. The army statement Saturday said Goldin "was killed in battle in the Gaza Strip on Friday." Hamas has never confirmed it was holding Goldin. The Israeli military statement was issued hours after Prime Minister Benjamin Netanyahu said Israeli troops would finish the job of destroying Hamas tunnels and then redeploy according to Israel's security needs. Netanyahu said Israel has already destroyed dozens of tunnels Hamas used to smuggle weapons and fighters from Gaza and into Israeli territory. He also said hundreds of Hamas militants have been killed since Israel launched its ground and air operations almost a month ago. In an address in Tel Aviv, Prime Minister Benjamin Netanyahu warns Hamas will 'pay an intolerable price' if it continues firing rockets at Israel, on Aug 2, 2014. In a televised address Saturday, the prime minister warned that Hamas will pay an "intolerable" price if it fails to stop rocket attacks on Israel. He also stressed that Israel has nothing against the "peaceful citizens of Gaza," saying he is very sorry for each civilian killed or wounded and encouraging international support to help rebuild Gaza. “We will take as much time as necessary and will exert as much force as needed,” he said in a televised address Saturday. Netanyahu’s comments came on the same day Israel announced it would not send envoys to planned truce talks this weekend in Egypt, after accusing Hamas of violating what was to have been a three-day cease-fire beginning Friday morning. The planned cease-fire fell apart Friday, with Israel accusing Hamas of killing two of its soldiers and capturing one in a morning ambush near Gaza's southern town of Rafah. Second Lieutenant Hadar Goldin was among Israeli soldiers dismantling a tunnel. Barely 90 minutes after the cease-fire took effect, Israel's military said, a suicide bomber attacked and gunfight broke out. The two soldiers were killed and Goldin went missing. Netanyahu said the Jewish state "will continue doing everything" to bring the missing soldier home. The prime minister warned Hamas will pay an "intolerable" price if it fails to end attacks on Israel from Gaza. He promised Israeli ctizens the military would "bring back calm and order ... no matter how much time" and effort it would take. He thanked them for "resiliance and unity." The prime minister apologized to Gaza's Palestinian civilians on behalf of Israelis. Saying "we have nothing against the citizens of Gaza," Netanyahu encouraged the international community "to help and support the rebuilding of Gaza." Netanyahu thanked United States and European leaders for their support, specifically praising U.S. President Barack Obama and Secretary of State John Kerry for defending Israel's "right to destroy missiles and tunnels." The comment seemed aimed at defusing some of the criticism leveled at the secretary over rocky peace efforts. Meanwhile, thousands of demonstrators marched in front of the White House Saturday to show their opposition to nearly four weeks of violence in Gaza. Some demonstrators denounced U.S. funding for Israel and criticized Obama's assertion that the Jewish state has a right to self-defense, and others carried mock coffins to represent Palestinians killed in Gaza. Earlier Saturday, Israel bombarded Rafah as its troops continued to search for the missing officer. A member of the Abed Aal family salvages belongings from his family's house destroyed in an overnight Israeli strike in Gaza City, Aug. 2, 2014. Palestinian health officials said at least 35 people were killed in the shelling in and around Rafah, while fresh airstrikes across Gaza destroyed dozens of houses. Gaza Islamic University was also hit hard by Israeli attacks. The Hamas military wing said it has no knowledge of the missing Israeli soldier's whereabouts. It said he likely was killed in an Israeli strike, along with the Hamas fighters who took part in the ambush. In a statement, Hamas said it had lost contact with its fighters. The military has nearly reached its goal of demolishing tunnels used by Hamas fighters to enter and infiltrate Israel, its spokesman, Lieutenant Colonel Peter Lerner, said Saturday. He said 31 tunnels have been blown up so far. "Our understanding is that our objectives, most importantly the destruction of the tunnels, are close to completion," Reuters quoted Lerner. Also Saturday, Israel said it was safe for evacuees of Beit Lahia, a northern Gaza town of 70,000, to return to their homes. 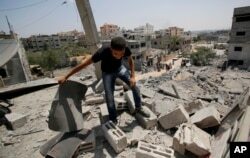 But the military advised residents "to beware of explosive devices Hamas has spread across the area," Reuters reported. An unnamed Israeli official told the Associated Press that the military's message that Beit Lahia residents could return was "a signal that things are pretty much being wrapped up." But armored vehicles still on the town's periphery made residents more wary of returning, Reuters said. "No one has told us to go back," it quoted Taleb Manna, 30, who'd taken his family to a United Nations-run school doubling as a shelter. "We can't risk going back and being bombed by the Israeli forces." After nearly a month of bombardment by the Israeli military, Gaza has become unrecognizable to Palestinians returning home after years in Israeli jails. Talking to the French news agency AFP, one man from the town of Deir al-Balah described the destruction as "a real shock." The Israeli cabinet had an exceptionally long and rare Friday night session to discuss the missing soldier. While it decided against sending envoys to Cairo, diplomatic efforts were to continue this weekend there with representatives of some of the conflict's other various factions. Reuters said representatives of the Palestine Liberation Organization, along with exiled officials of Hamas and the Islamic Jihad militant group, were expected to participate in the talks. "We are still continuing these [diplomatic] efforts with everyone, with all sides," Egyptian President Abdel Fattah el-Sissi told journalists Saturday. His country's proposed cease-fire represented the best way forward, Sissi said, adding it would aid negotiations to end "the violence and the killing and the bloodshed in Gaza." Israel demands that Gaza be demilitarized and that Hamas rocket attacks on Israeli territory stop, while the Palestinians insist Israel and Egypt end their blockades of Gaza, which have strangled the Gazan economy and keep Palestinians from traveling. The fighting has been costly to Palestinians and Israelis alike. Since Israel began its offensive July 8 to halt rockets fired by Hamas and other militants, more than than 1,650 Palestinians, mostly civilians, have been killed, Gaza health officials said. Israel has lost 63 soldiers and three civilians - a greater toll than in its 2006 war with Lebanon, the Associated Press reported. The death toll includes at least 296 Palestinian youngsters, the United Nations said Saturday. U.N. children's agency UNICEF has counted 187 boys and 109 girls killed, with at least 203 under age 12. The agency expects the count to rise, AFP said, because these were only the deaths verified to date. Hospitals in Gaza were overwhelmed with wounded after 26 days of fighting, said the head of a network of Palestinian civic groups, Amjad Shawa. "All Gaza is under attack. The humanitarian conditions are catastrophic due to the continuous Israeli air strikes [and] artillery bombardment in different areas of Gaza Strip,” Shawa said. “Most of the targets are civil premises." He said humanitarian groups are unable to feed or provide health care to the estimated 400,000 Palestinians displaced by the conflict. United Nations humanitarian officials on Saturday warned of a widespread health disaster in the Gaza Strip unless the ongoing fighting stops immediately, criticizing the lack of protection for Gaza-based doctors and medical facilities, calling the region's medical services are on the verge of collapse. Obama has called on Hamas to immediately and unconditionally free the soldier to show that Hamas is serious about trying to resolve the situation in Gaza. At a news conference Friday, Obama repeated that Israel has a right to defend itself from Hamas rockets and attacks. But he called the deaths of Palestinian civilians heartbreaking and said everything must be done to protect them. Late Friday, U.S. Congress approved $225 million in emergency funding to help resupply Israel's Iron Dome missile defense system, sending the measure to Obama to be signed into law. The House vote was 395 to 8. An Israeli website said Saturday the Iron Dome system intercepted several rockets not long after Hamas said it had fired three rockets at Tel Aviv. VOA's Scott Bobb contributed to this report from the Gaza Strip. The AP, AFP and Reuters also contributed.